Vancouver kept on rolling Saturday thanks to a big night from Alex Edler. The Canucks defenceman scored the overtime winner, had an assist and led both teams with 27:45 in ice time as the visitors won 3-2 over the Calgary Flames on Saturday night. Just over three minutes into a back-and-forth extra frame, Edler one-timed a pass from Brock Boeser that just dribbled through the pads of David Rittich. "I just tried to give it to [Boeser] and tried to create some space for him. No one picked me up and he made a great pass back to me," said Edler, who has four goals and 11 points in 16 games since returning from a knee injury that sidelined him for a month. Having battle back to take the lead in the second period, the Flames lamented letting a point slip away in overtime. "It was a frustrating game," said Travis Hamonic, who had one of two shorthanded goals for the Flames. Calgary's lead atop the Pacific Division is down to one point over the San Jose Sharks, who the Flames host on New Year's Eve Monday. "We've been cute here recently. I think we've been too cute," said Flames coach Bill Peters. The Canucks' improved penalty killing played a key role in the victory, going five-for-five, thwarting a 54-second two-man advantage. Vancouver has not allowed a power-play goal in 10 of its last 11 games. "You have five power plays, you've got to get at least one or two, and especially on home ice," said Calgary centre Sean Monahan. "It isn't as sharp as it needs to be." 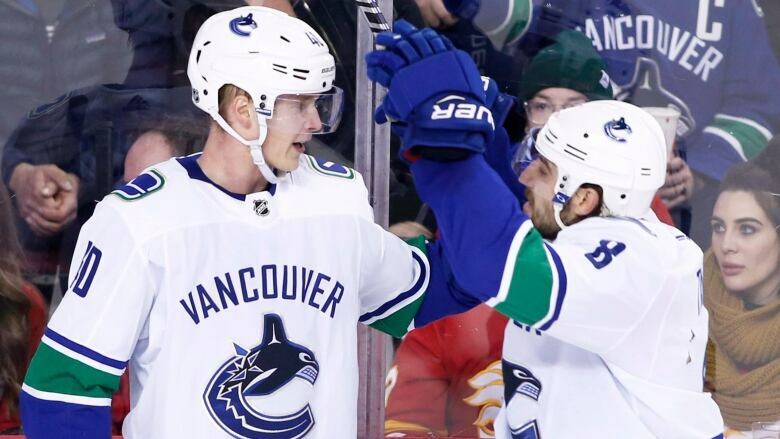 The Canucks made it 2-2 at 11:37 of the second when rookie sensation Elias Pettersson broke down the right side and whipped a 40-foot wrist shot past Rittich. "We trust each other, trust the game plan. We have confidence and patience," said Pettersson, whose 39 points (19 goals, 20 assists) is 15 more than the next closest player in the rookie scoring race. Boeser also had a goal and an assist for Vancouver (19-18-4). The Canucks, who are 5-0-1 in their last six on the road, have four points through the first two stops of their six-game road trip while the world junior hockey championship takes place at Rogers Arena. Mark Jankowski also scored for Calgary (23-12-4), which leads the league with 12 shorthanded goals, one more than the Arizona Coyotes. Jankowski, who added an assist on Hamonic's goal, is tied with Arizona's Michael Grabner for the league lead in both shorthanded goals (four) and shorthanded points (six).